We know that bearded dragons come from the hot desert areas of the Australian outback. 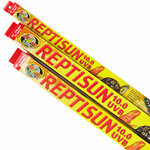 Because of this, bearded dragons receive UVA and UVB radiation naturally from the sun. This radiation is essential for the health of the bearded dragon, so it is important to understand bearded dragon lighting requirements. Since bearded dragons need this radiation from the sun, we must replicate it when kept indoors. The best way to reproduce these rays is by specialized, full-spectrum lighting supplied by fluorescent (Amazon.com) and mercury vapor light bulbs (Amazon.com). These full-spectrum bulbs are readily available at most pet stores. It is important that your pet receives at least 10 to 12 hours of exposure to the lighting each day. Failure to provide UVA and UVB rays can lead to many health issues including mental problems, loss of appetite and metabolic bone disease. Make sure the bulb you choose offers at least five to seven percent UVA and UVB radiation. UVA radiation helps your bearded dragon to remain healthy, stimulated, and maintain a healthy appetite. 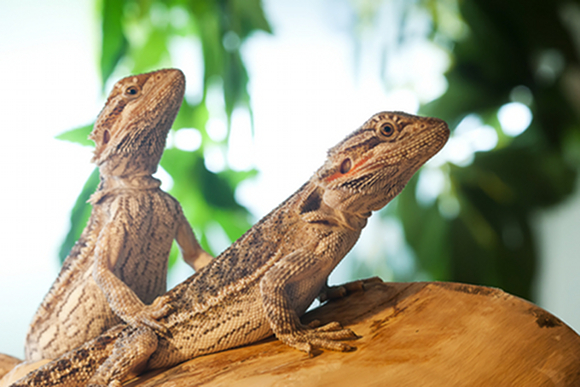 UVB radiation gives the bearded dragon the ability to metabolize vitamin D3 and calcium. Next we will go over each type of bulb and how to select the best bulbs for your specific needs. The most common full-spectrum bulbs used by enthusiasts are fluorescent tube bulbs (Amazon.com). 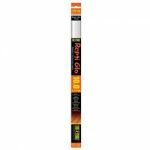 You can’t use just any ordinary fluorescent bulb, it has to be one manufactured especially for desert-dwelling reptiles. These bulbs come in lengths ranging from 15 inches to 48 inches in length. The length you need will depends on the length of the enclosure. You should use a fluorescent bulb that is at least 80% the length of the enclosure. For instance, if the enclosure is 60 inches long the shortest bulb you should use is 48 inches in length. If the enclosure is greater than 60 inches long then you will need to use two or more bulbs to supply enough UVA and UVB radiation over the length of the enclosure. 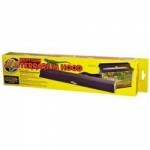 Fluorescent tube bulbs need to be housed in a hood or ballast (Amazon.com) that is specifically designed for use with reptile bulbs. These bulbs also tend to lose their intensity over time and need to be replaced about every six months in order to provide optimum radiation. 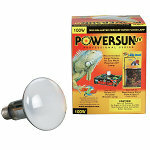 In recent years compact fluorescent bulbs (Amazon.com) have gained popularity in the reptile husbandry world. These are the “curly” or “twisty” looking bulbs. 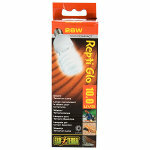 These bulbs offer good radiation benefits while consuming less power to operate. There has been some debate within the reptile-keeping community over the safety of these bulbs. There have been instances where the bulb has caused some reptiles to suffer from burned eyes leading to cases of blindness in the pet. As we mentioned, this has been highly debated. Some users have experienced no detrimental effects from the bulbs, while others swear against their use. We recommend using the long fluorescent tube bulbs over the compact fluorescents until further testing and effects are supplied by manufacturers. 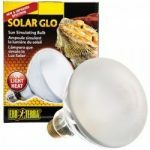 Mercury Vapor bulbs (Amazon.com) are used by many bearded dragon owners and breeders as one of the most preferred lighting options. These bulbs provide adequate amounts of both UVA and UVB rays and also provide heat (which we’ll cover in the next section). Mercury Vapor bulbs are more costly than fluorescent tubes, but tend to last much longer. The downside to Mercury Vapor is they provide heat and UVB radiation in a relatively small area directly under the bulb. Fluorescent tubes provide radiation over a longer area, but provide little heat. So, if you use a Mercury Vapor bulb in the basking area the bearded dragon will receive adequate radiation and heat while basking, but if it moves to another area of the enclosure it will not receive radiation until it moves back under the MV bulb. If you use a fluorescent tube that covers the entire length of the enclosure the bearded dragon will receive adequate radiation throughout the entire enclosure. Once you select the best lighting bulb for your enclosure, it is time to determine the placement of the bulb. The placement is critical because if you place the bulb too far away the bearded dragon may not receive enough radiation or heat. Never place your lighting bulbs above glass. Glass will block crucial UV radiation causing your bearded dragon to receive inadequate exposure. We recommend using a screen cover (Amazon.com) instead of glass. Fluorescent tube bulbs should be mounted in a hood or ballast (Amazon.com) that is designed for reptile use, and placed no more than 12 inches from the floor of the enclosure. Placing these bulbs farther away than 12 inches greatly reduces the effectiveness of the bulb. If the height of your terrarium is greater than 12 inches you may need to add extra substrate to decrease the height. Mercury Vapor bulbs should be placed no higher than 20 inches from the floor of the terrarium for full effectiveness. Generally Mercury Vapor bulbs are placed at one end of the enclosure to replicate a basking area. Always read and follow the bulb manufacturer’s recommendations for proper bulb placement for your specific model and brand of bulb. Which ever lighting you decide to use it is important to keep them on an appropriate light cycle each day. Just as our lives are generally dictated by the rising and setting of the sun, the same is true for bearded dragons. It is very important to replicate day and night within the enclosure. During the summer months you should provide your bearded dragon with a minimum of 14 – 16 hours of daytime light and UV exposure and 8 – 10 hours of nighttime exposure. During the winter months the light cycle should be decreased to 10 – 12 hours of daytime light and UV exposure and 12 – 14 hours of nighttime exposure. The exact amounts of daytime light and nighttime exposure can vary as long as the bearded dragon receives a minimum of 10 – 12 hours of UV exposure per day. The best practice for accomplishing the correct light cycles is by plugging the daytime and nighttime lighting into a timer (Amazon.com) that switches the lights off and on at the specified times throughout the day. Now that you have a general feel for the lighting requirements of bearded dragons, let’s discuss the topic of heating your bearded dragon’s enclosure.